Bahari, A., Delshadmanesh, M. (2008). Photoemission measurements of Ultrathin SiO2 film at low take-off angles. International Journal of Nanoscience and Nanotechnology, 4(1), 31-34. A. Bahari; M. Delshadmanesh. "Photoemission measurements of Ultrathin SiO2 film at low take-off angles". 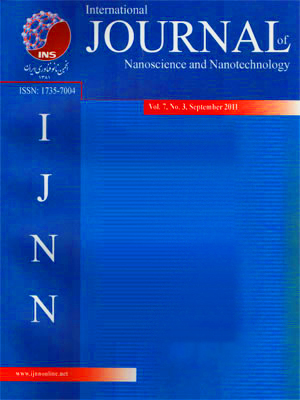 International Journal of Nanoscience and Nanotechnology, 4, 1, 2008, 31-34. Bahari, A., Delshadmanesh, M. (2008). 'Photoemission measurements of Ultrathin SiO2 film at low take-off angles', International Journal of Nanoscience and Nanotechnology, 4(1), pp. 31-34. Bahari, A., Delshadmanesh, M. Photoemission measurements of Ultrathin SiO2 film at low take-off angles. International Journal of Nanoscience and Nanotechnology, 2008; 4(1): 31-34. The surface and interfacial analysis of silicon oxide film on silicon substrate is particularly crucial in the nano-electronic devices. For this purpose, series of experiments have been demonstrated to grow oxide film on Si (111) substrate. Then these films have been used to study the structure of the film by using X-ray photo emission spectroscopy (XPS) technique. The obtained results indicate that the photoemission measurements on the ultrathin oxide should be done at low take-off angles to emphasize the oxide features.